Many medium or small size companies would benefit from opening contacts with Chinese counterparts aimed to the exchange of products or technologies. In many cases such companies do not enjoy the critical mass or the structure necessary to identify and develop such contacts (which in many cases need to be personal and well established) and eventually to manage the projects which could be originated. The support offered by ABCS could span from the strategic analysis and identification of the potential benefit which could be expected from contacts with a potential Chinese partner to the identification of such partner and the management of the follow up activities. 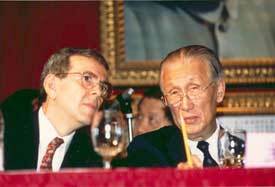 Antonio Ballada with Doctor Ku Chen Fu, Chairman of Taiwan and People Republic of China Straits Commission. ABCS can provide management and coordination on projects involving negotiations at international level, particularly in Asia. The projects where ABCS can offer skilled support cover the area of trading of products and technologies and the area of Joint Venture planning and establishment. ABCS can rely on the co-operation of a number of experts in many areas of the management of projects or the management of business issues. ABCS coordinates the activity of the Professional Division of Experts for Internationalization in APCO, which allows to offer specialist and multi discipline advice to medium size companies and, in case, support to the dedicated management of bigger concerns to help overcome pick situations in the effort of implementing the internationalization projects. ABCS will also be available to provide training sections to medium-top level management in the specific subjects of Business strategy and Marketing strategy. A special area of knowledge refers to the Chinese cultural and business environment. (see Il Sole 24 Ore). 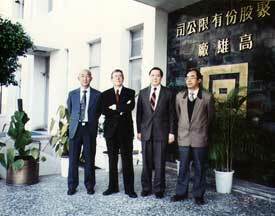 Antonio Ballada and his team as President of Taiwan Polypropylene. Capability and related facilities to distribute in China and Taiwan Italian products taking advantage of already well established trading companies. Capability and related facilities to distribute in Italy Chinese products, targeting the consumer goods market, taking advantage of an already established firm. Capability and needed skills to represent Chinese companies in Italy, with the purpose to manage Chinese interests in Europe and to implement business development opportunities.